So... similar to my last recipe for champagne glazed shortbread cookies, today's post was supposed to be a completely different post. I tend to plan my editorial calendar for my blog months in advance, and for my first recipe in 2018, I was going to cater to the New Year's Resolution masses and develop a recipe for grapefruit detox popsicles. Whatever that means (Because a detox popsicle? Really? Who am I kidding?). But because I've been working slowly and steadily on my book, Weeknight Baking, I always have a ton of ingredients leftover from the recipe testing. Leftover doughs, good-but-not-quite-perfect cakes, 1/4-cup of some ingredient here or there. The worst was when I was working on the white cake recipe. There was about a week in which I always had about a dozen egg yolks leftover at the end of the day that I didn't know what to do with. 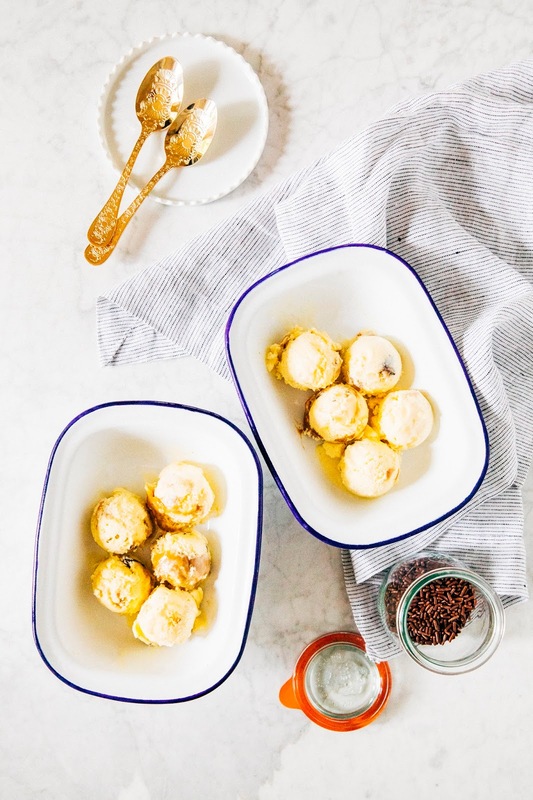 At first, I was using the egg yolks in custards: a key lime pie requires four, this egg yolk chocolate chip cookie recipe can be adapted to use another four. But that still left me with another four. And repeating the tests the next day would leave me with another 12, leading to 16 yolks total. Four per recipe wasn't enough to keep up with the volume of egg whites I was using. I needed to find the heavy hitters — my grandma's leche flan recipe used 12 egg yolks, Miette's yellow cake recipe used another 10 (for a six-inch cake; crazy huh?). 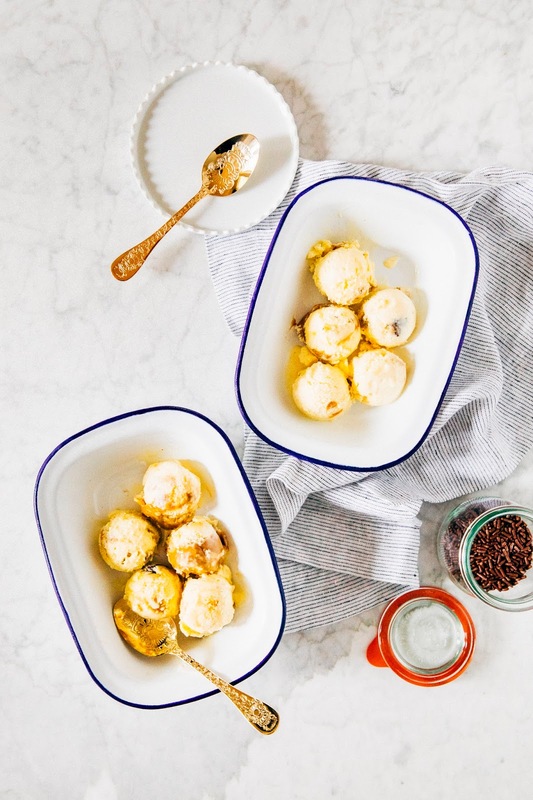 Thomas Keller's vanilla ice cream recipe in the Ad Hoc At Home cookbook? Calls for 10 yolks. I've had that recipe bookmarked for ages, but of course, never actually made because well, ya know, it required 10 egg yolks. And guess what? My version uses 12. If I'm being honest, I'll be very surprised if any of you guys make this recipe, because, well, 12 egg yolks. I get it. But it's good, and 100% worth making if you ever find yourself in a situation with 12 leftover egg yolks. 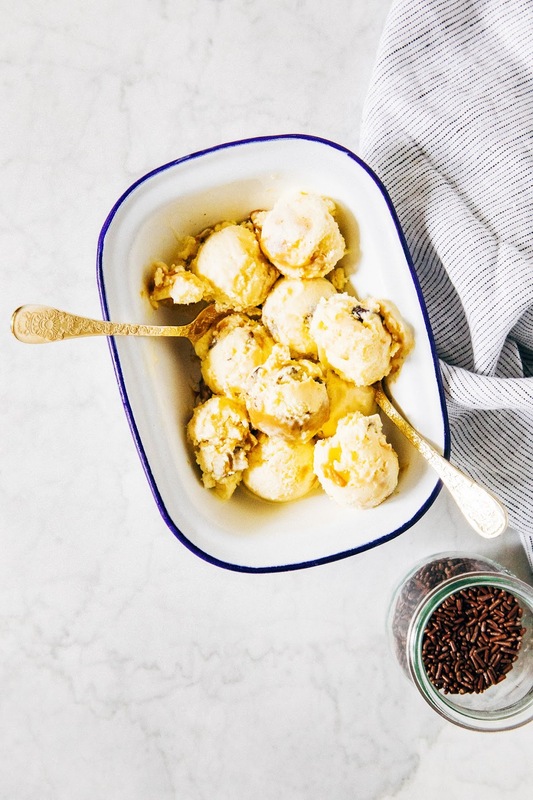 All those yolks lead to a thick, creamy, hearty custard base that's unparalleled by most other ice creams. And for good measure, I threw in some leftover dulce de leche and Stella Parks' cookie dough nuggets. So much for detox popsicles. This ice cream is pretty much the opposite of all that. It's vice cream. 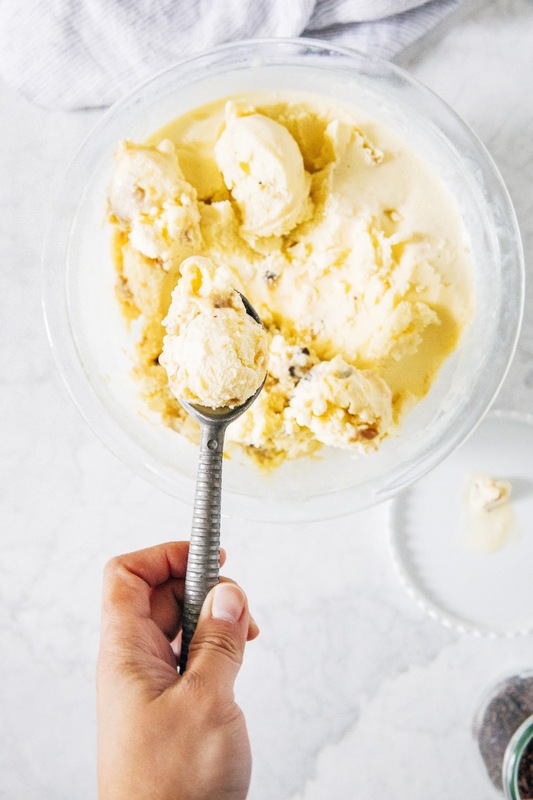 To make this recipe, you'll need some special equipment: an ice cream maker (I love Breville's ice cream maker — you don't need to freeze the bowl beforehand to use it! ), and a set of medium and large bowls that can nest inside each other. The nesting bowls are used to create an ice bath that will help cool the custard down quickly and prevent it from cooking further. This recipe uses egg-free cookie dough nuggets made with corn syrup to bind the ingredients together; corn syrup is used instead of egg to prevent illnesses and help keep the dough a sticky, biteable texture (because regular frozen cookie dough would actually probably chip your teeth if you tried to bite into it. The recipe is adapted from Stella Parks' book, Bravetart; her original recipe instructs you to scoop the dough with a 1/4 teaspoon measuring spoon, but I found it was too sticky and hard to work with. I ended up freezing the dough instead and using a sharp knife to cut it up into nuggets instead. But if you're pressed for time, definitely go for the scooping method! Other ingredients of note in this recipe include vanilla bean powder and dulce de leche. Vanilla bean powder is made from pulverized vanilla bean pods, and is basically a cheaper version of the real stuff — find it online and in specialty stores. In a pinch, use a real vanilla bean pod! As for the dulce de leche, I used homemade dulce de leche left over from these brownies; you can find the canned variety at any Latino supermarket or use your favorite caramel sauce instead. In the bowl of a freestanding electric mixer fitted with a paddle attachment, combine 1/4 cup dark brown sugar, 2 tablespoons unsalted butter, 2 teaspoons vanilla extract, and 1/4 teaspoon kosher salt. Beat on low speed to moisten, then increase mixer speed to medium and beat for about 5 minutes to help the sugar dissolve. Pause to scrape the bowl and the beater, then beat in 3 tablespoons corn syrup, one tablespoon at a time. Reduce mixer speed to its lowest setting and sprinkle in 1/4 cup flour, followed by 3 tablespoons mini chocolate chips. Scrape down the sides of the bowl. Wrap the cookie dough in plastic wrap and transfer to the freezer to chill for at least 4 hours, but preferably overnight. Once the dough has formed into a solid mass, use a sharp knife to cut them into 1/4-teaspoon sized nuggets. 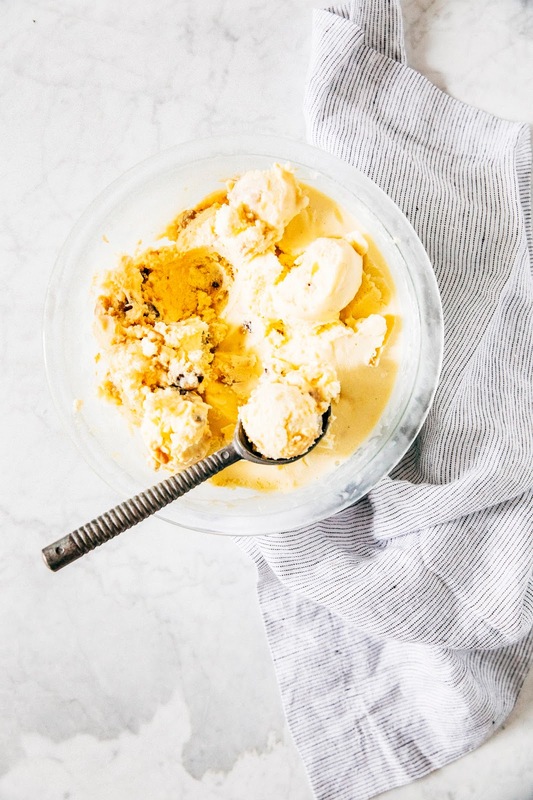 Keep it small, because to quote Stella: "Your inner child may scream for bigger chunks, but in a spoonful of ice cream, I promise those pieces will seem huge." Transfer the nuggets to a Ziploc bag and place in the freezer until ready for use in ice cream; the nuggets will keep up to 6 months in the freezer. Prepare an ice bath in a large bowl and set a medium bowl in the ice bath. Set aside. In a large, heavy bottomed saucepan over medium heat, whisk together 2 cups heavy cream, 2 cups whole milk, 1/2 cup granulated sugar, and 1 teaspoon vanilla bean powder. Continue to heat, stirring occasionally, until the mixture is just below a simmer. Meanwhile, whisk the remaining 6 tablespoons granulated sugar and 12 egg yolks in a large bowl until slightly thickened and the whisk leaves a trail. Slowly, while whisking, add about 1/2 cup of the hot milk mixture to the yolk mixture, then whisk in the remaining milk mixture. Set a fine-mesh sieve over the original saucepan and strain the liquid back into the pan. Cook the mixture over medium heat, stirring constantly and scraping the bottom and sides of the pan with a wooden spoon, until steam begins to rise from the surface and the custard thickens enough to coat the back of a spoon. Remove pan from heat. Place the fine mesh sieve over the medium bowl in the ice bath and strain the mixture into the medium bowl. Whisk in 1/4 teaspoon kosher salt. Let the mixture cool in the ice bath for about 30 minutes, stirring from time to time. Once the mixture is cooled, press plastic wrap against the surface of the custard to prevent a skin from forming, and transfer to the refrigerator to chill until cold, but preferably overnight. The colder the mixture is, the less time it will take to freeze in the ice cream machine, and the better the texture will be. Pour the custard into an ice cream maker and freeze according to the manufacturer's instructions. 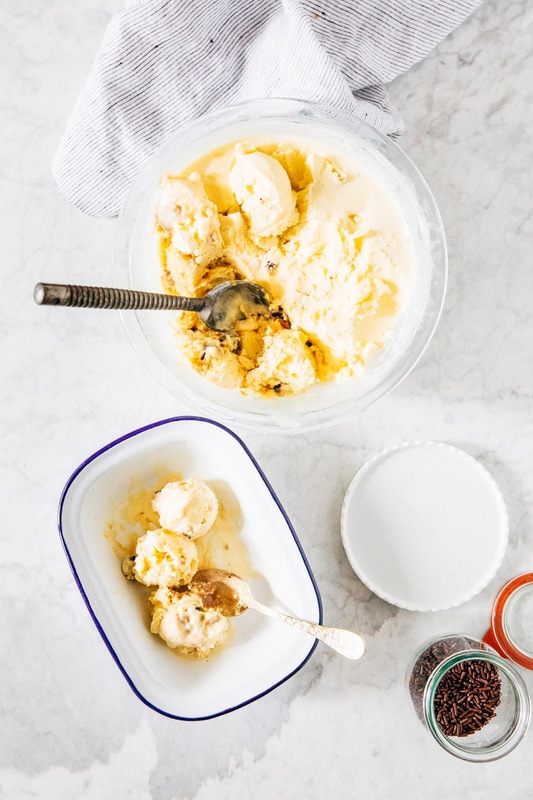 When the ice cream is thick and creamy and almost finished (it should have the texture and look of soft serve), microwave 1/4 cup dulce de leche on high in short bursts of 10 to 15 seconds until soft and pourable. Pour the dulce de leche slowly through the opening in the top of the ice cream machine and allow it to solidify and break up in the ice cream for about 2 minutes; the dulce de leche will solidify in small chunks throughout the ice cream. Drop in the cookie dough nuggets and allow the ice cream machine to stir them throughout the ice cream. Pack the ice cream into a storage container, pressing a sheet of parchment directly against the surface and sealing with an airtight lid. Freeze in the coldest part of the freezer until firm, at least 4 hours.